This chapter tells the story of office-to-residential change of use in Reading. A similar format is taken to the previous English case study chapters in terms of the research approach and coverage. The chapter highlights the particular key concerns seen in Reading, particularly the loss of affordable housing. 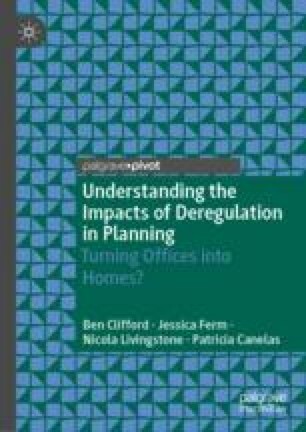 These issues surrounding the wider social contribution made from development are highlighted throughout the chapter and through its focus on the particular ways that central government driven deregulation has had impacts in Reading. Demos-PwC. (2016). Good Growth for Cities Index. https://www.pwc.co.uk/goodgrowth. Accessed 1 September 2017. Reading Borough Council. (2011). Reading 2011 Census Factsheet. http://www.reading.gov.uk/media/3779/2011-Census-Analysis/pdf/2011-Census-Analysis.pdf. Accessed 28 January 2018. Savills. (2017). Reading: A New City in the South East of England? Savills Spotlight. http://pdf.euro.savills.co.uk/uk/spotlight-on/spotlight-reading—2017.pdf. Accessed 9 October 2017.